What Is A Jig and Pig for Bass Fishing and Why Should I Use One? 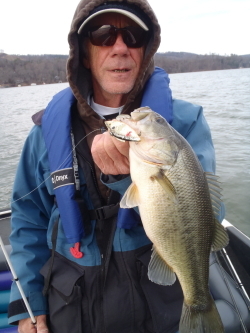 If you read or hear much about bass fishing, you will hear people say they use a jig and pig. But what is a jig and pig and why should you use one to fish for bass? The jig part is a lead head jig with rubber legs or skirt. It may or may not have a weed guard on the hook. The pig can be several things. The first ones were Uncle Josh Pork Rind Frogs – hence the name “pig.” Now most fishermen use a plastic pig and they can be many shapes and sizes. Some popular ones are chunks – a round body with two legs like the Zoom Chunk. I like a twin curly tail trailer like the Zoom Creepy Crawler or Fat Albert. Others look like crawfish, like the Net Bait Paca Craw. They come in a wide variety of colors. The pig is attached to the hook of the jig so the body is mostly covered by the skirt and the legs or tails stick out behind the bait. It is important to put the pig or trailer on so it is straight and the legs at a flat plane with the head, perpendicular to the hook. If it is bent the bait may spin and twist your line. If it is at an angle it does not look natural. 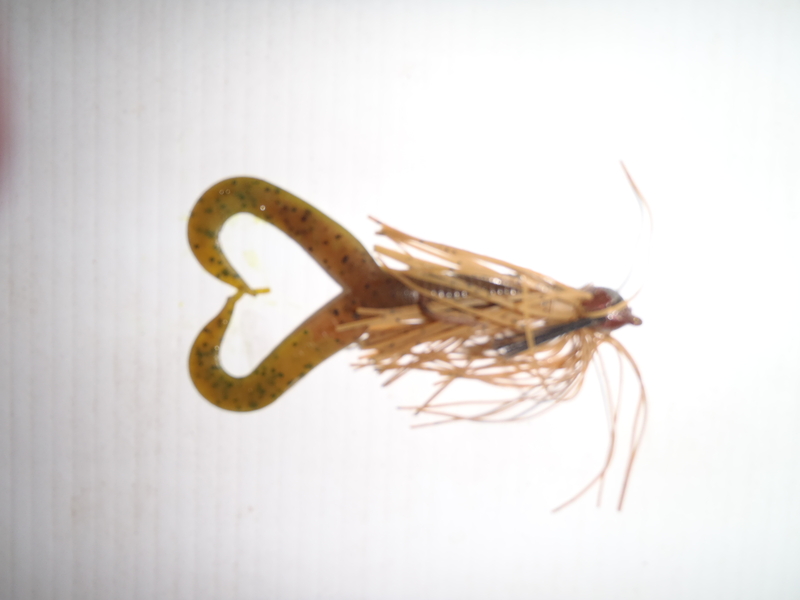 The picture above is of my favorite jig and pig – a Strike King Bitsy Bug with a Zoom Creepy Crawler trailer. This one is in browns for clear water. I use a black and blue jig and blue trailer in stained to muddy water. I use a 3/16ths to 1/4 ounce Bitsy Bug and always dip the tips ot the trailer, no matter what color it is, in chartreuse JJs Magic. For deeper fishing or when the wind is blowing too much for the light jig, I go with the same colors in a 3/8ths to 1/2 ounce Rattleback Jig with the bigger Zoom twin tail Fat Albert trailer. And if I am trying for bigger fish I use the bigger bait. A big bass will hit the smaller bait but I do think bigger fish like bigger baits. The Bitsy Bug and Creepy Crawler is a great bait for spotted bass but largemouth love it, too. I have done well many tournaments on a variety of lakes on these baits. A jig and pig can be fished in all kinds of structure and cover. And they can be fished in a wide variety of ways. This entry was posted in Bass Fishing, fishing basics, How To Fish on May 3, 2015 by ronniegarrison.